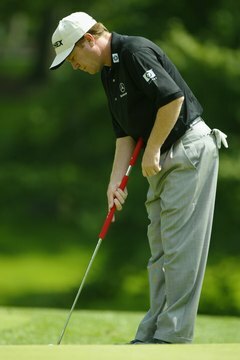 As Champions Tour player Jeff Sluman demonstrates, a belly putter should be anchored in the abdomen and centered a few inches above the waist. Belly putters have become more common at country clubs and PGA Tour events over the past few years. Golfers are breaking away from the standard-length putter in search of something that can make putting easier. Belly putters range from 41 to 43 inches long, much longer than a standard 35-inch putter. Those extra inches allow you to stabilize the putter in your abdomen and eliminate any excess wrist action. The end result is a consistent pendulum stroke. When buying a belly putter, it is important to get properly fit. If the putter does not fit you properly, your posture will look too erect or too bent over. When choosing the length of your belly putter, you want to be able to bend forward to a 45-degree angle and have the grip hit your abdomen. A local pro can help you choose the proper length. Grip size and shape are personal choices. Most grips are circular, but you can select any size or shape. Bend over comfortably to a 45-degree angle and anchor the putter in your abdomen. The grip should be centered a few inches above your waist. Position the ball in the center of your stance to match where the belly putter is anchored. Use the same grip you use with other putters. Swing the putter back and through, keeping the grip anchored in your abdomen. As long as the grip does not twist out of position, the putter face will stay square. Your wrists should be inactive throughout the stroke, but you will feel your arms and shoulders move. Practice swinging the putter back and through the same length to groove a pendulum stroke.